A potential megafight between UFC bantamweight champion Ronda Rousey and Invicta FC featherweight championCris "Cyborg" Justinocontinues to hinge on a single issue: Justino's weight. Rousey (12-0) successfully defended her UFC title for the sixth time via first-round knockout against Bethe Correia on Saturday. The 135-pound title fight headlined UFC 190 at HSBC Arena in Rio de Janeiro. As has been the case for years, Rousey was asked about Justino (14-1) during the UFC 190 postfight news conference -- and, as has been the case for years, Rousey blamed Justino's past use of performance-enhancing drugs for the fight not happening yet. 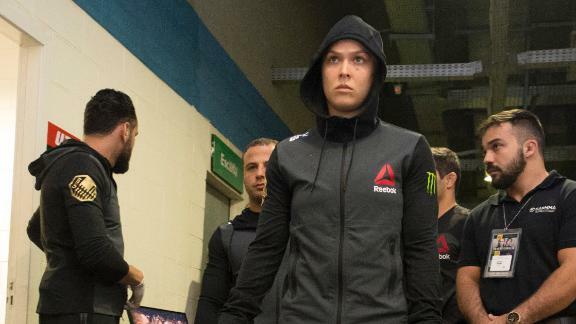 "I'm prepared to deal with anything, that's why I'm the champion," Rousey said. "I fight in the UFC, in the 135-pound division. She can fight at 145 pumped full of steroids or she can make the weight just like everybody else without them." Justino, 30, tested positive for an anabolic steroid following a knockout win as the Strikeforce featherweight champion in December 2011. She blamed the positive test on a diet supplement given to her by a former coach. In recent years, Justino has passed multiple random drug tests in Nevada and California. The Brazilian champion has never fought at 135 pounds and has expressed doubt in the past regarding her ability to get that low. She is expected to fight at a 140-pound catchweight in her next Invicta bout, likely in the fall. If all goes well, Justino will attempt to get down to 135 pounds early next year. On Sunday, Justino responded to Rousey's comments via Instagram. "To be a champion, I think you have to see the big picture," Justino wrote. "It's not about winning and losing; it's about hard work every day and about thriving on the challenge. It's about embracing the pain that you'll experience at the end of the race and not being afraid. I think people think too hard and get afraid of a certain challenge." UFC president Dana White has stated numerous times the promotion will not consider a catchweight fight between Rousey and Justino, although Rousey has competed at 145 pounds during her career. The UFC does not currently promote a 145-pound division. "The Cyborg thing is complicated, because everybody is ready to go," White said on Saturday. "I'm ready for Cyborg. Ronda is ready for Cyborg. Everybody is ready for that fight, but Cyborg has to make the weight. "If I was Cyborg, I would have tried to jump into the Octagon (after Rousey's win). I think she was here. I'd be trying to jump in the Octagon, saying, 'I'm next, give me my shot next.' It's there. The fight is there. She's just got to make weight. There's talk, but I don't see her doing the necessary things to make that fight." Rousey has finished all but one of her UFC title fights in the first round. She is expected to fight Miesha Tate later this year. Justino has fought twice in 2015, recording back-to-back first-round knockouts. UFC women's bantamweight champion Ronda Rousey speaks to the media about her thoughts of potentially fighting Cris "Cyborg" Justino.